Paris bridges and other historic monuments are being buried in locks. Let's stop this madness! 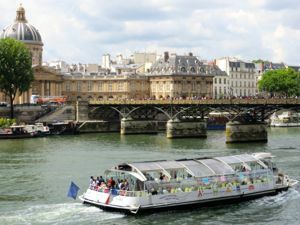 One of my favorite memories of Paris is walking on the lovely Pont des Arts, a footbridge across the Seine. 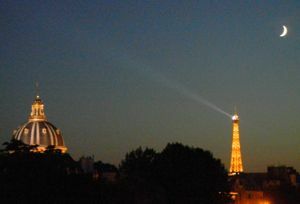 It offers gorgeous views—in one direction the Eiffel Tower, in the other Notre-Dame. On warm evenings young people gather with a bottle of wine, some bread, some cheese, a guitar, and have fun. People stroll by, enjoying the views, watching the Seine cruise boats pass by, listening to the music. What happened to that wonderful scene? A few years ago people started attaching "Love Locks" to the bridge, and it became covered to the point of being dangerous—as well as downright ugly. Above, Lock salesman right on the Pont des Arts! 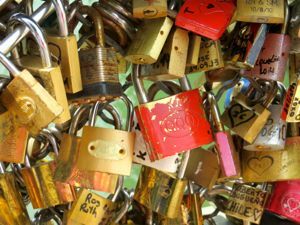 The idea is that you and your love buy a lock (which unfortunately many people are willing to sell, even right on the bridge), write your initials on it, lock it to the bridge, and toss the key into the Seine. Over the years the bridge became overloaded with locks, and the Seine was polluted by the thousands of keys tossed in. Sure, some of the locks glimmer in the sunshine, but you could no longer look out through the sides. Several sections of the bridge actually collapsed, a dangerous situation. But fortunately the city of Paris took on the responsibility of clearing the bridge of lock and installing lock-proof clear shields. So while the Pont des Arts isn't the same as it used to be, it can once again be enjoyed. What to do? 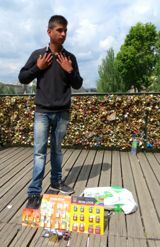 Some enterprising ex-pats started a No Love Locks movement and petitioned the Mayor of Paris to stop this practice and take down the locks. They are urging all tourists to respect the beauty and history of this Paris monument and treat it well. A campaign has been started to encourage people to take selfies and post them on a special web site, Love Without Locks, rather than leave a tangible symbol. What can you do? If you love Paris, respect the city and its monuments. And sign the petition. Let your voice be heard and help protect this beautiful city and its monuments. If you love a person, take a selfie and send it to Love Without Locks. Don't "lock" yourselves onto a bridge and deface the city. Discourage others from putting locks on the Pont des Arts and other monuments. Above, From a distance the Pont des Arts looks fine. Below, But up close is a different story. Is this what you want to see in Paris? taken from the Pont des Arts.